Folks shorter than 3 feet tall are honestly the best when it comes to making and keeping friends. Their sense of wonder and overall joie de vivre makes them the perfect magnets for new relationships, while their untainted understanding of logic allow them to make quick and simple decisions about their interactions with others. Given their talent in this area, we adults are wise to take a few tips from our kids. 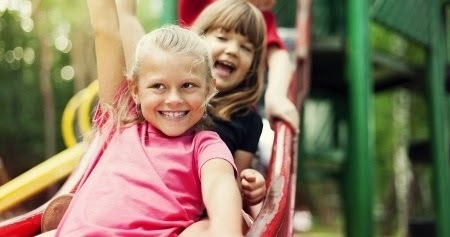 On or off the playground, watch little kids—they are always on the hunt for potential new friends. Killing time in line for the slide? That’s a great time to chat up the preschooler in front of them. Hey, they apparently share a similar interest, and ... they may have Legos! The lesson here is that one never knows where a new friend may happen to cross our paths. Opportunities for new friendships can absolutely happen when we aren’t specifically seeking them, but they happen even more frequently when we make a conscience effort to seek them out. That’s what little kids do, they seek them out, for the simple reason that friendships bring happiness, and kids are all about happiness. So, if you are seeking some new friends to add to your life, chat up people in the coffee line, or smile and say hello to gal on the spin bike next to you. Making yourself open to new friendships, opens you to new friendships, so don't be surprised when they start to appear. And when they do, they just may have Legos. Sharing, at its core, is about generosity and support. When a child shares his/her cool toy in the sandbox, they are displaying their ability to care about others, empathize, and be generous. And the result is that other inhabitants of that sandbox feel better about, relate better to, and generally like the sharer more than the other sand-logged tikes. The same is absolutely true for adults. Well, except that when adults want to display caring, empathy and generosity, they typically do it through communication, support and intimacy, and not a bucket and paddle, but you get the point. If you want more people to like you … share. Share your thoughts, emotions, your time and your support. Sharing is the first step towards intimacy, and intimacy is the foundation of solid friendships. Little kids don’t let things linger. They live in the moment and are focused really on just one thing – joy, fun, another chance at exhilaration. They simply are having too good of a time enjoying life that they can’t be bothered with worrying about some past (and probably petty) unpleasantness. In a nutshell, children routinely move past and on from former problems or disagreements, and adults would be wise to do the same. After they’ve talked an issue out, they forget it, forgive it and don’t allow it to influence their present interactions. Children aren’t haunted by “ghosts” of issues-past. The prudent adult will heed this childish trait. And finally, when it becomes obvious that two kids aren’t playing well together, you know what those children do? They simply continue to make themselves happy and joyful by playing with other kids. Yep, that is right, they don’t make a big fuss about the fact that they don’t play well, they don’t try to fix or blame the other kids. They simply go and find another kid with whom they do like to play. Sure it can sting when feelings aren’t mutual here, but since kids follow all the above rules, they have other kids who are available for play-dates and such. The point here is that children, again, are much more realistic than many adults. They know when something isn’t working, and rather than internalize or attempt to overlook or fix it, they simply set about finding a friend with whom they do mesh. So many women really struggle with friendships. They find it hard to make new friends, find it hard to maintain existing friendships, and often find themselves with hard feeling when it comes to their friendships. But the truth is that it is these women, again most women, who are making their own friendships/relationships difficult. By following the above rules for friendship, as taught by mere children, then perhaps their/our friendships will in deed become easier and more joyful, and we in turn, happier. If you are seeking more friendships, look to online communities, like SocialJane.com, to help.